There are 10 reviews of Grey Vetiver Eau de Toilette. Starts off lemony, thin and metallic. The drydown keeps the dryness from the metallic feel but goes more in the green vetiver way. Feels mature and dressed up, but versatile for weather. Projection is average but persistent while longevity is good, lasts all workday. The more citrus, less "soapy" and more "sparkly" version of Grey Vetiver EdP. I see a parallel between Grey Vetiver EdP and EdT and of Cartier's L'Envol EdP vs. EdT., in that the EdT's came out second after the original EdP's, and that the EdT's felt like somewhat hollowed out versions of the EdP's. In both cases, the EdT's seemed more suited for casual occasions and younger wearers vs. the EdP's. In both cases also, I tended to prefer the deeper, richer EdP's in comparison. Touted as the version of Grey Vetiver that is citrus-forward and fresher than the EDP, it certainly achieves this. GVEDT wears ight and never loses a refreshing, hesperidic edge. THe vetiver is of the grassy variety, slightly soapy, and I have to say somewhat of the artificial in tone. However for all this I would suggest the EDT as a good fragrance for those who don't like vetiver - it's just that accessible. Some obvious comparisons are Guerlain's Vetiver (the TF being less rigid and without the tobacco note at the core), and Terre D'Hermes (TF being less metallic and chemically than that)m as well as - particularly at the beginning - Eau Sauvage. This is good company and it's not for nothing that GV has been described as an ideal work scent. It does not have great projection but consistent low-key presence and is subtly masculine, clean, and hardly likely to offend. Where many of the Tom Fords recall Guerlain and the Parisian style, this is more of a Grasse-type scent. It would, I imagine, be hard to over-apply. What a nice surprise! For those of us who found Grey Vetiver EDP too severe, here's a lighter EDT interpretation that still preserves the masculine vibe and features citrus more prominently. Aside from the vetiver it's difficult to pick out individual notes, which lends this scent an air of mystery. A mature fragrance without being stuffy. Smells very elegant and expensive. Released after the EdP (which I prefer) the initial blast of Grey Vetiver EdT resembles Eau Sauvage EdT. After Grey Vetiver dries down, you're left with a faint whisper of fresh cut vetiver with something chalky - think that's the wintergreen note. Not awful but not exciting either. 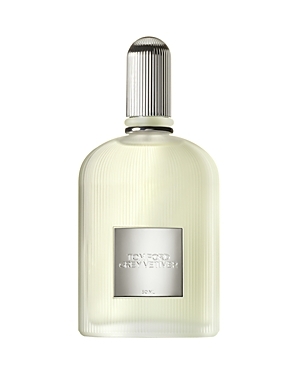 Tom Ford Grey Vetiver Eau de Toilette 1.7 oz. There are no member images of Grey Vetiver Eau de Toilette yet. Why not be the first?